This is the only easel painting that can be dated with certainty to Rosso's* stay in France in 1530-40. The cushions beneath Christ's body bear the blue alerions on an orange background of the coat of arms of Constable Anne de Montmorency, from whose château at Ecouen the Pietà was taken to the Louvre in the late 18th century. The marks visible on the bodies of Christ and St John are due to an initial, reversed composition - vsible under X-ray photography - which Rosso had blacked out. At the time of the French Revolution Rosso's Pietà was confiscated from the Château d'Ecouen, the residence Anne de Montmorency, Constable of France, had built for himself. Set above the main door of the chapel, the painting was doubtless a commission: the Constable's coat of arms can be seen on the cushions Christ is resting on. The work may originally have embellished the Chapel's stone altar, now to be found in the Château de Chantilly. After de Montmorency's fall from favor, his assets passed to the Condé family. This is the only surviving example of the religious works Rosso executed in France. A tormented but highly creative personality, Rosso put his all into the strikingly tragic composition of this scene. The tight framing thrusts the figures into the foreground, leaving the grotto in the rear scarcely visible. In the center the Virgin, arms spread wide as a sign of suffering and supported by a saintly female figure, occupies the entire width of the canvas. Stretched before her, the pallid, emaciated body of her dead son is held by Mary Magdalene and St John as it rests on cushions bearing the Constable's colors and coat of arms. Shot through with personal anguish - Rosso committed suicide in 1540 - the picture also embodies the formal and intellectual aspirations brought to France by the Italians. The Council of Trent came out against this type of painting, finding it too overtly expressive for its religious subject matter. Recent laboratory studies at the Louvre have revealed the presence of an earlier work, abandoned by the painter, in which the arrangement of the figures is reversed. It is not known, however, if this underlying painting was a finished work or simply a rough version. Under the spell of Italian culture after his success in the Italian wars, François I was keen to have Italian artists at his court. He first invited Leonardo da Vinci and then, in 1530, called Rosso from Florence to the palace at Fontainebleau. Rosso worked on the decoration of the palace, wuth Primaticcio joining him some years later. There he created an original, complex oeuvre whose high point is the gallery of François I, where a sophisticated allegorical and symbolic vocabulary emerges in a mingling of sculpture, stuccowork and painting. He also brought to France a new view of the human figure, with its roots in Florentine Mannerism*: the elongated bodies, expressive forms, angular creases, and bright colors that are to be found in the Louvre Pietà. 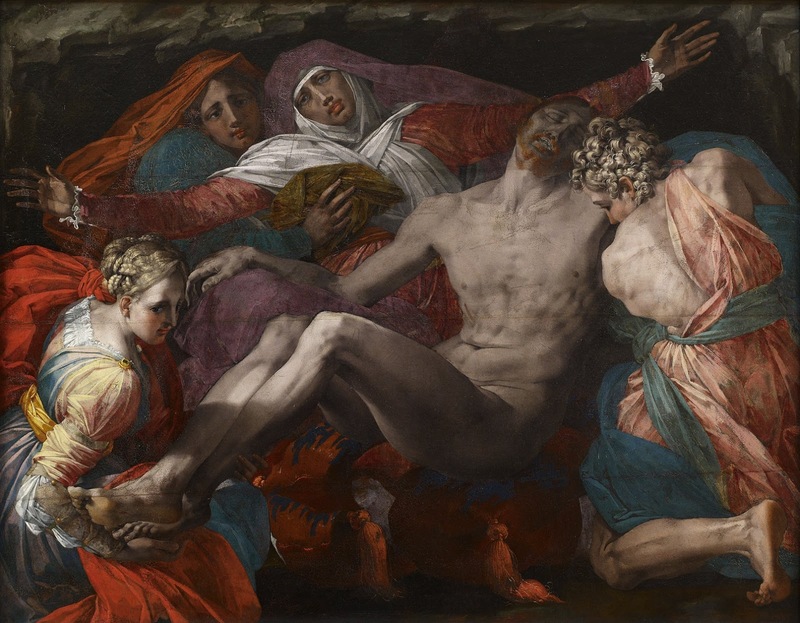 La Pietà è un dipinto a olio su tavola trasferita su tela (270x201 cm) di Rosso Fiorentino*, databile al 1537-1540 circa e conservato nel Louvre di Parigi. Si tratta dell'unica opera sicuramente originale tra quelle eseguite dal Rosso alla corte di Francesco I di Francia. L'opera, secondo la testimonianza di Vasari*, fu commissionata subito dopo la decorazione della Galleria di Francesco I nel castello di Fontainebleau. Lo storico aretino indicò come committente il connestabile Anne de Montmorency, il cui armoriale si trova anche sul cuscino su cui è appoggiato Cristo; la Pietà si trovava proprio nel suo castello d'Écouen (appesa sulla porta della cappella), dal quale è poi pervenuta nel museo parigino, alla fine del XVIII secolo. Sotto i corpi di Gesù e di Giovanni sono stati trovati ai raggi X i segni di una composizione inizialmente pensata all'arrovescio, che fu coperta con lo sfondo scuro. Il corpo di Cristo è rappresentato in primo piano e, semidisteso, occupa tutta la superficie del dipinto. Gli fa eco Maria che, disperata, allarga le braccia arrivando a sfiorare i bordi del dipinto e rivivendo, simbolicamente, il martirio della crocifissione. Essa è retta da una pia donna col capo coperto da un pesante velo rosso, mentre Gesù è tenuto ai piedi dalla Maddalena, dall'abbigliamento e l'acconciatura raffinatissimi, e da Giovanni apostolo, rappresentato inginocchiato di spalle a destra in una complessa torsione, complementare a quella della Maddalena. Le figure occupano praticamente tutto il campo a disposizione, lasciando poco spazio allo sfondo scuro che simula il sepolcro aperto. Esse hanno un tono eroico e drammatico, evidenziato dalla gestualità, ma tutto sommato austeramente contenuto, che Antonio Natali ha definito "da coro di tragedia greca". La luce si sofferma radente sul primo piano della composizione, lasciando lo sfondo nelle tenebre, e accendendo varie tonalità di rosso negli abbigliamenti dei personaggi, alle quali fa da contrasto la fascia bianca che avvolge il collo e la testa di Maria, nonché il giallo della veste della Maddalena e il candore delle sue trine. Le pieghe dei panni appaiono dure, quasi scolpite, più che mai taglienti.